What's your special day? Your birthday? Graduation? Engagement? Wedding? The birth of your child? Or maybe it's special for a reason only you know. Sterling silver Calendar Fleur de Lis Charm features the month of your choice with a Swarovski crystal birthstone of your choice marking your special day. 1" square. 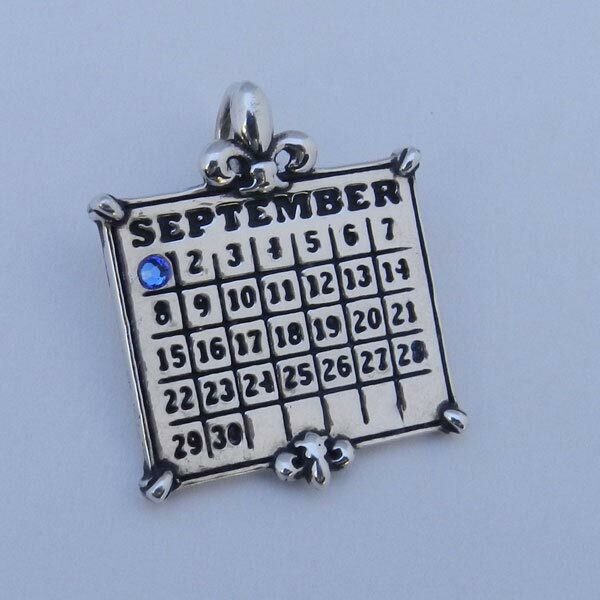 Specify month, date and crystal: Garnet (Jan), Amethyst (Feb), Aquamarine (Mar), Clear Crystal (Apr), Emerald (May), Light Amethyst (June), Ruby (July), Peridot (Aug), Sapphire (Sept), Rose (Oct), Topaz (Nov), Blue Zircon (Dec). Made in the USA. Allow 2 weeks. No rush delivery. Item can only be shipped within the Continental US.